With so many home automation systems on the market, it would be easy to overlook Wink in favor of bigger players like Samsung SmartThings, Nest, and Amazon Alexa. But with an easy installation, a user-friendly app, and consistently reliable performance, the Wink Hub 2 is an approachable choice if it’s your first time using a smart home system. Wink Hub and Wink Hub 2 were created with the everyday consumer in mind. Both products allow all your smart home devices to work together to create a safe and smart home, from smart locks and thermostats to light switches and more. Wink Hub 2, Wink’s most updated offering, is a faster, sleeker and more reliable version of its predecessor. Wink Hub 2 is compatible with more smart home technologies, giving you the power to manage a ton of smart products from more brands, all with one app. To find out more about how the Wink Hub systems work, watch the video below. Both Wink home automation systems allow you to control and customize your smart products through the Wink app. Wink Hub, the original offering, requires a manual setup, which can prove difficult for even the savviest of consumers. It’s also more limited in terms of capability—it supports only Wi-Fi networks with 2.4 GHz routers and offers only 64MB of memory. Wink Hub 2 functions in the same basic ways but is smaller and much more mighty. Wink Hub 2 can run on Wi-Fi networks with either 2.4 GHz or 5 GHz routers and also has an Ethernet port, giving you more options for faster connections. Plus, the smart device has an impressive 512MB of memory, so it can remember a lot more automated actions, which Wink calls robots. Wink Hub 2 also has Bluetooth capabilities, better network support, and a sleeker design than the original. And if you’re worried about hackers, don’t be: Wink Hub 2 features a new hardware-based security called Secure Boot, which ensures that only Wink software can run on the hub. That makes it a lot harder for outsiders to take over the smart devices in your home. Wink Hub 2 is the clear winner between itself and its predecessor, so let’s look at some of the pros and cons of using the latest Wink smart hub. What works with Wink Hub? To make sure all your smart home products can communicate with Wink, you need to make sure to get smart home products that have the “Wink Hub Compatible—Wink Hub Required” seal on their packaging. Using a product that doesn’t have Wink’s sticker on it runs you the risk of your smart hub going glitchy. Still, you can use tons of products alongside Wink Hub 2. Want to add automated lights to your home? Wink Hub 2 compatible devices like GE Link Connected LED bulbs and Sylvania Smart RGBW bulbs can get you there. 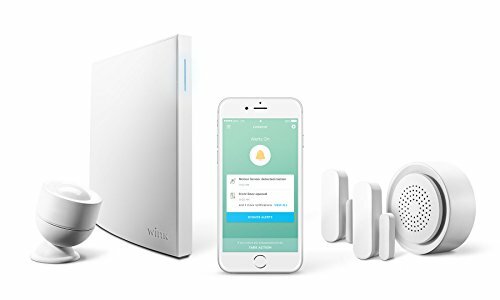 Wink Hub 2 is also compatible with a variety of dimmers, switches, and outlets, like the Leviton Decora Smart In-Wall Dimmer; smart detectors and sensors like Ring’s video doorbells; and much more for your locks, garage doors, and thermostats. In fact, Wink is compatible with tons of familiar brands, from Honeywell to GE, so you can upgrade your home while using brands you already trust. When comparing Wink Hub vs. Wink Hub 2, Wink Hub 2 wins hands down. But how does Wink Hub 2 shape up against Samsung SmartThings, one of our top recommended home automation systems? Overall, the Wink Hub 2 comes in a close second to SmartThings. Samsung’s SmartThings hub is a little harder to set up, often requiring a multistep approach. Thankfully, the work is rewarding. With some patience, you can become a master of your own home with the SmartThings hub, creating a smart home setup that better fits your needs. SmartThings’ range is between 50 to 150 feet, giving you more access to the smart products in your home. Although Wink Hub 2 is widely compatible with a range of popular third-party devices, it’s best when controlling three or so devices, and it has a range of only 50 feet. Otherwise, Wink tends to suffer a lag time between when an action is triggered and when the reaction occurs. (That one is a common complaint.) But it’s still a great bargain for consumers who are new to the game of smart home devices, especially because the companion app for Wink Hub 2 is clean, modern, and straightforward. Wink also offers starter kits like Wink Bright, which helps you control the lights in your home from the app; and Wink Lookout, which helps you keep an eye on your home. These starter kits typically include the Wink Hub 2 and a few other Wink devices, depending on your selection. The Wink Starter kits are an easy way to venture into making your home a smart home—but if you have anything bigger than an apartment, you’ll have to buy additional products. Installing Wink is a pretty straightforward endeavor. Once you’ve purchased your Wink Hub, you have to download the Wink app and create an account. From there, you add your product—Wink Hub or Wink Hub 2—to your app, place your hub in its new home, and connect it to the internet via Wi-Fi or Ethernet cable. Customer service is a big deal, and Wink offers support via phone, Twitter, and a support page on its site. Any queries submitted online via Wink’s support page are answered within 24 hours, but for pressing queries, your best bet is calling in. Personally, I dread talking to any customer service person over the phone, but at Wink, the customer service representatives are friendly, super knowledgeable, and genuinely happy to answer any and all questions—even if you have several, as I did. They also follow up by email, so if you didn’t write everything down after chatting, you have something tangible to reference in the future. This is a decent product. It was easy to configure and add several GE and Zooz dimmers and switches. The iOS app works well and so does the integration with Amazon Echo. “Hey Alexa, turn off the kitchen lights” is pretty fun. I’ve been using this for about 2 weeks now with good results. If you’re more tech-minded, Samsung’s SmartThings may be for you, as it offers a wider range of capabilities and customizations, allowing you to create a smart home that works for you. But if you’re considering a smart hub for the first time, we highly recommend purchasing Wink Hub 2. It’s a user-friendly product that won’t feel overwhelming every step of the way. If all the smart home automation choices are overwhelming you, go with Wink Hub 2—it’s a great way to keep your house safe or keep the electricity bill low when you keep forgetting to turn off the lights. Do you have a Wink Hub 2 or other home automation hub in your home? What are your thoughts? Tell us what you think in the comments below.